Discover all you need to know about Lumiere London 2018 with these frequently asked questions. Lumiere London is a world-class light festival produced by Artichoke, an arts charity and the UK’s leading producer of art in the public realm. It’s commissioned by the Mayor of London, and supported by a host of funders, sponsors and donors. Returning to London for the second time following the success of the first edition in January 2016, the free outdoor light festival is London’s biggest festival of light to date. It showcases the capital’s spectacular and iconic architecture and streets, through the vision and work of UK and international artists. In 2016, it attracted an estimated 1.3 million visits over four nights. The 2018 edition has an expanded footprint extending north to south, from King’s Cross, through Fitzrovia, Mayfair, and London’s West End, to Trafalgar Square, Westminster, Victoria, South Bank and Waterloo. Community groups in the London boroughs of Barking and Dagenham, Croydon, Greenwich, Lambeth, Redbridge, and Waltham Forest have helped to make of some of the installations that will be on show at the festival. 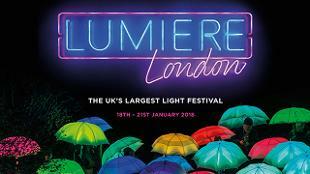 Lumiere London takes place over four evenings, from Thursday 18 to Sunday 21 January 2018. What can I see at the festival? There are more than 50 installations at Lumiere London 2018. Find a mix of projections, neons, interactive pieces and illuminated sculptures. Discover more about the artists and installations. 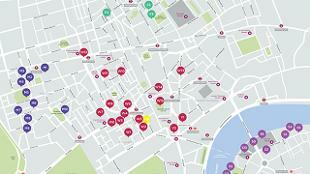 You can also buy a festival programme for £5 from locations across the festival footprint. Is there a map available to download? Download the free Visit London app from the App Store or Google Platform to plan your visit, including saving your favourite installations. You can also buy the Lumiere London map for £1, enabling you to navigate around the festival sites easily. What time is Lumiere London? The festival is open from 5.30pm-10.30pm each evening. Lumiere London takes place across six main destinations: King’s Cross, Fitzrovia, Mayfair, London’s West End, Westminster & Victoria, and South Bank & Waterloo. Yes, the event is free for the public to attend. Artichoke endeavours to make all of its events free. Lumiere London is produced by Artichoke, a registered charity and one of the UK’s largest artistic production companies, that creates work in the public realm. Lumiere was first created by Artichoke in Durham in 2009, and has taken place every other year since. In Durham, the festival is commissioned by Durham County Council and supported by Arts Council England. In 2013, Artichoke also produced Lumiere in Derry-Londonderry for its City of Culture celebrations, commissioned by Culture Company 2013. The festival is being funded through a mix of public and private organisations including the Mayor of London and several other funders, sponsors and donors. There will be significant road closures in central London in order to accommodate the anticipated numbers in the audience. Find out more. Are local businesses and residents being consulted? Businesses and residents who may be affected are being contacted directly. Letters with details of the impact of the festival were distributed in December and January. Find out more. Won’t trade be affected by the disruption of road closures? Every effort is being made to keep disruption to the minimum. As well as the cultural element, one of the key reasons for staging Lumiere London is to encourage more visitors into central London, and make them aware of the broad offer available year-around. What about the theatre trade? Every effort is being made to keep disruption to the minimum. Detailed information will be released to ensure theatre-goers are aware when planning their journey. Artichoke is working with UK Theatre and the Society of London Theatres to make sure that theatre-goers’ needs are part of the planning. Guide dogs are welcome at Lumiere London, but due to the number of people expected to attend it’s unsuitable for family pets. In the interests of everyone’s comfort and experience, we ask that only assistance dogs are brought to the festival. Is there be any strobe/flashing imagery? None of the installations use strobe lighting or flashing imagery, however some include projections and bright lights. Please check the programme for more information. What’s the best way to visit the festival? Please leave your car at home. Use public transport and walk between installations where possible. Find out how to travel to and around the festival. Where can I buy a Lumiere London printed guide? 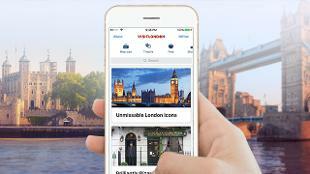 Find the sales locations on the Visit London app. Where can I find public find toilets during Lumiere London? There are free public toilets available across the festival footprint. Discover where these are. I have mobility issues, where can I find out information about how to get around? Lumiere London requires road closures to ensure the safety of visitors around a number of significant installations. These closures will impact on the flow of traffic through central London (and beyond) and mean that traffic in certain areas will be heavier than usual and delays are likely. See information about road closures. Disabled visitors are advised where possible to utilise accessible stations when travelling into London. Those who need to drive into London can still do so as per usual, mindful of the impact of the closures, and park in Blue Badge bays as per usual to access Lumiere installations. It is not possible to give more detailed advice than this, given the wide footprint of Lumiere 2018 (which extends from King’s Cross in the north, through central London and to South Bank in the south). Numbers of visitors may also make moving from installation to installation slower than expected. Lumiere London takes place outside, at night, and the streets will be very busy at times. This means getting around some of the installations can be challenging for some people, particularly if it rains, as the cobbles can become slippery. Thursday and Sunday nights are usually quieter times to visit. Generally flat but step into Whitfield Gardens. Generally good access across installation sites. There is a lift to access Brown Hart Gardens. Flat access across the other installation sites. There is a ramp to access St James's Church. Royal Academy surface is slightly cobbled but flat. Generally good access across other installation sites. What should I bring to Lumiere London? It is likely to be cold and possibly wet during the festival. Please make sure you bring warm clothing and prepare for the elements. Artichoke works closely with the Metropolitan Police, British Transport Police, Ambulance and Fire services to plan for security and safety at the event. During the festival, event security will be managed by trained stewards working with the Metropolitan Police, British Transport Police and other agencies. Remain vigilant and report anything of concern to a steward or police officer. Find out more about staying safe in London. The full programme has been announced. Find all you need to know at: www.visitlondon.com/lumiere. What are the Lumiere London social media handles?